Last week I traveled to Las Vegas with several of my colleagues for the eLearning Guild’s DevLearn 2011 – a meeting for learning and development designers and professionals to share ideas, skills and best practices. 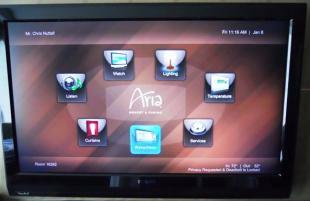 Like many of the conference attendees, I stayed at The Aria, a brand-new, plush hotel in Las Vegas’ City Center area. It’s gorgeous, well-thought out, and, well, full of Clicky Clicky Bling Bling (CCBB). See the image at right? Try and guess how long it took me to figure out how to set the alarm clock. Then tell me what a “lighting design” is, because I still haven’t figured out how to turn off the lights over the bed without turning off the reading lamp. We make the same mistake with enterprise technology. Just because we can doesn’t mean we should. Sometimes the simplest course – a video, for example – or the simplest learning management system is the best for your situation. Just because some technology is great doesn’t mean more technology is better. Flash does not equal function. Next time you’re dreaming up solutions, shopping for elearning courses or building technology, ask yourself if each layer of complexity is solving a problem or merely adding complexity. For example, the Aria alarm clock never woke me up. Good thing I set my iPhone as a backup.